Hatchbacks have always been my favorite body configuration of a car. 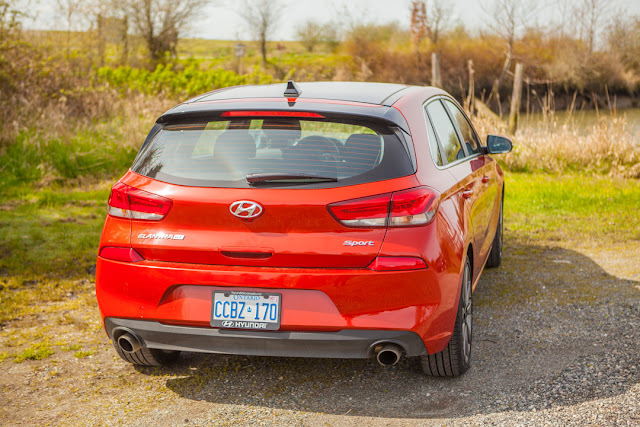 A good hatchback provides decent passenger space and cargo options much like a compact SUV. The lowered center of gravity and reduced weight mean that they generally handle better and are more fuel efficient on the road. Now if you put a turbo charged 201 hp engine under the hood, coupled it with a 7-speed dual clutch automatic transmission, stiffen the suspensions, and re-tune the steering, you have all the essential recopies for a proper hot hatch - a car that offers all the practicality of a hatchback and gets your pulse racing on a twisty back road. That is what Hyundai has done with the 2018 Elantra GT Sport. It is sold in European as the Hyundai i30 and it is Hyundai's attempt to compete with the likes of Mazda 3, Honda Civic Si, and the gold standard of a hot hatch, Volkswagon Golf GTI. 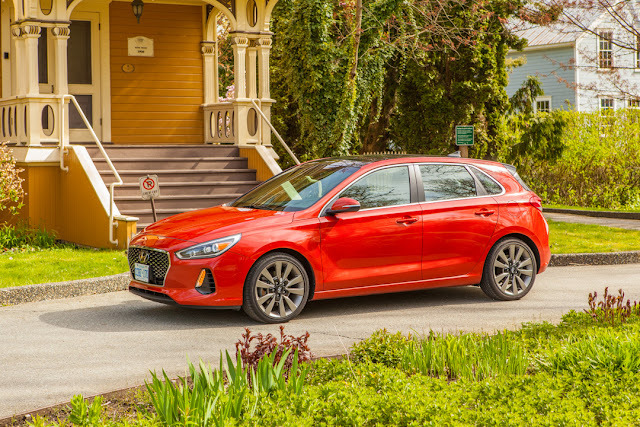 The exterior of the Elantra GT is designed by former Audi designer Peter Schreyer. It is an elegant looking car with sharp, clean character creases sweeping through the entire side profile. The signature cascading grille looks especially fitting on this car. 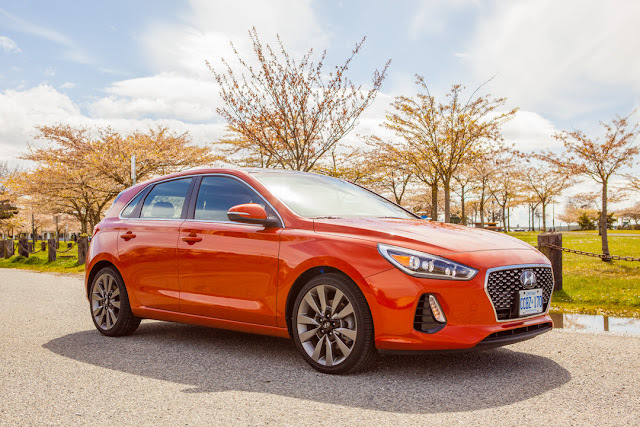 Our tester, courtesy of Hyundai Canada, comes in an attractive two-tone color design with Phoenix Orange body, black roof, and black rear spoiler. LED bulbs are equipped for both front and tail lights. The light housings are narrow and sharp which gives the car that European look. The lower grilles provide additional cooling for the front brakes and manage airflow around the wheels to minimize turbulence and wind resistance. I really like the amber LED daytime running lights reside inside the lower grilles. It is both distinctive and attractive. 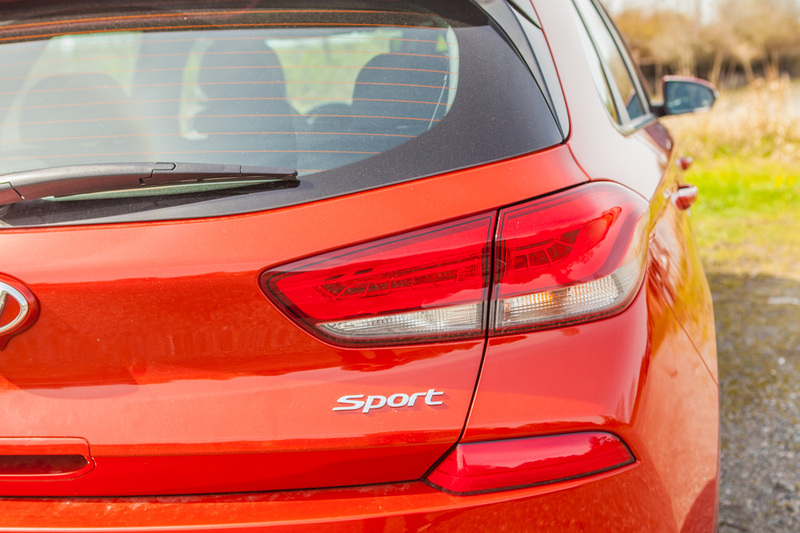 The Sport version of the Elantra GT comes standard with 18 inch alloy wheels. In my opinion, they look a little bit too muted. In fact, I find the overall exterior design of the car too restrained. It certainly is a good looking car but the exterior styling doesn't convey its sporty nature. On the other hand, the slick, elegant look would please more mature, conservative customers. While I find the exterior of the Elantra GT Sport a little too conservative, the interior is a completely different story. It is smart, sporty, and functional. 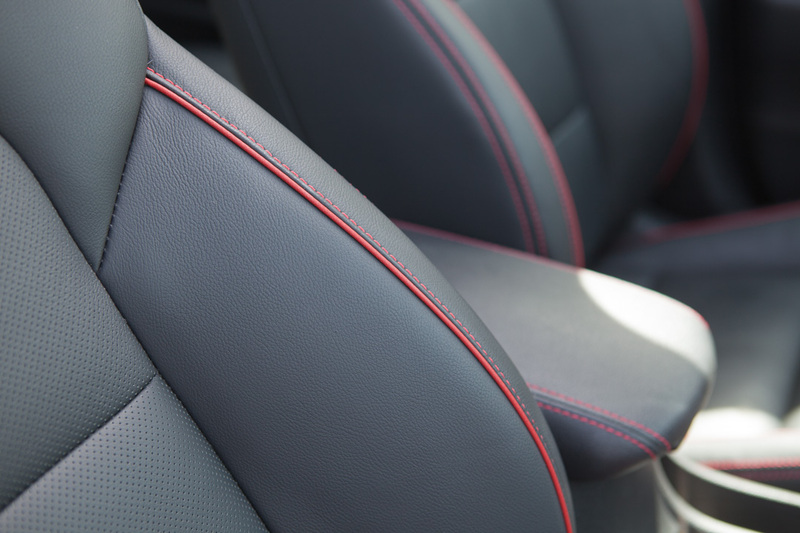 The attention to details gives this interior a premium feel. There is red accent trims around the air vents, push start button, climate control console, and steering wheel. You can also find the same red stitching on the leather seats, leather shifter boot and leather armrest. Hyundai even went through the trouble of finding the Elantra GT matching red seat belts. The first I have seen at this price range. The front seats are very comfortable with supportive bolsters. 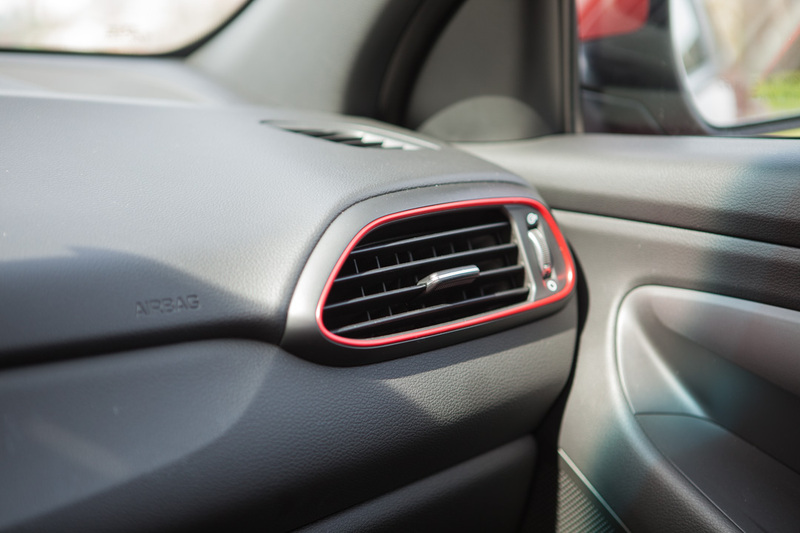 They are also both heated and vented with the Sport Ultimate Trim. Soft-touch materials are used for most larger surfaces in the cockpit with some smaller areas covered in hard plastics. Moving to the back of the car, the first thing you will notice is the huge panoramic sunroof, which is hard to find in this segment. There is a decent amount of legroom for the rear passengers. 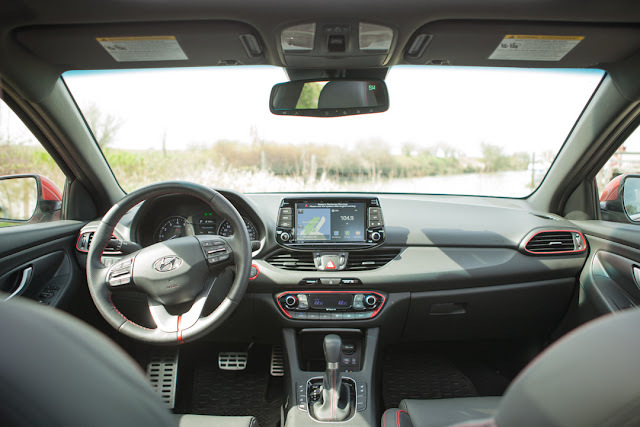 Taller passengers may find themselves tucking their feet under the front seats, but being a hatch back, the rear head space is very good. 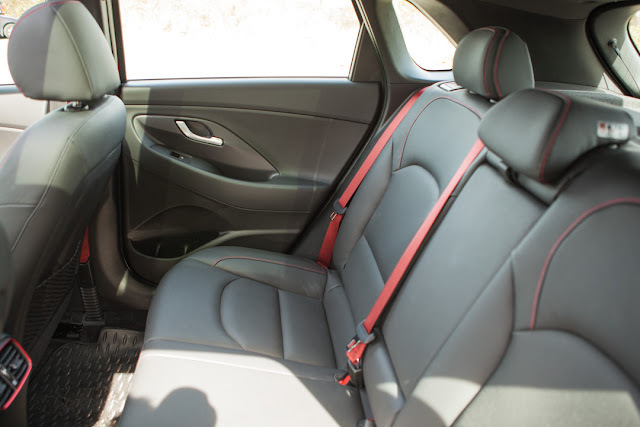 I am happy to report that the red seat belts are also provided for all three rear seats. 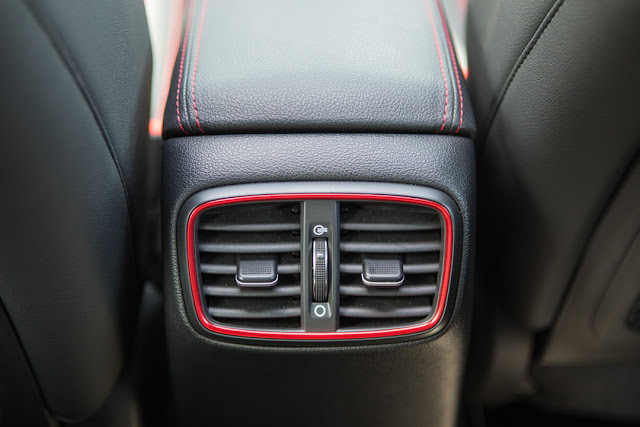 There is a rear air vent behind the front armrest, and a sturdy fold down rear armrest joint with two cup holders. I must say it is my favorite interior of all the Hyundai vehicles I have driven so far. The design is modern, sleek and very practical. I really appreciate how much thoughts were put into every single detail. All the Hyundai vehicles I have test driven so far have great infotainment systems. 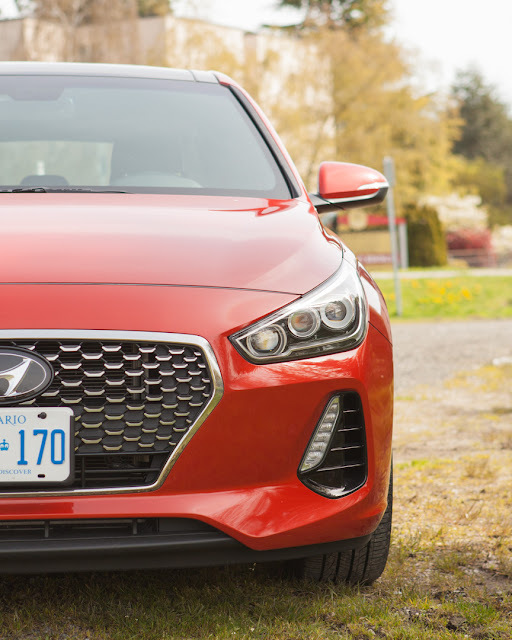 The Elantra GT Sport is no exception. The 8 inch touch screen display is a joy to view and operate. I particularly like how the control buttons and knobs are integrated right beside the display. This to me is the most logical place to place them, and the whole setup looks clean, smart, and space efficient. 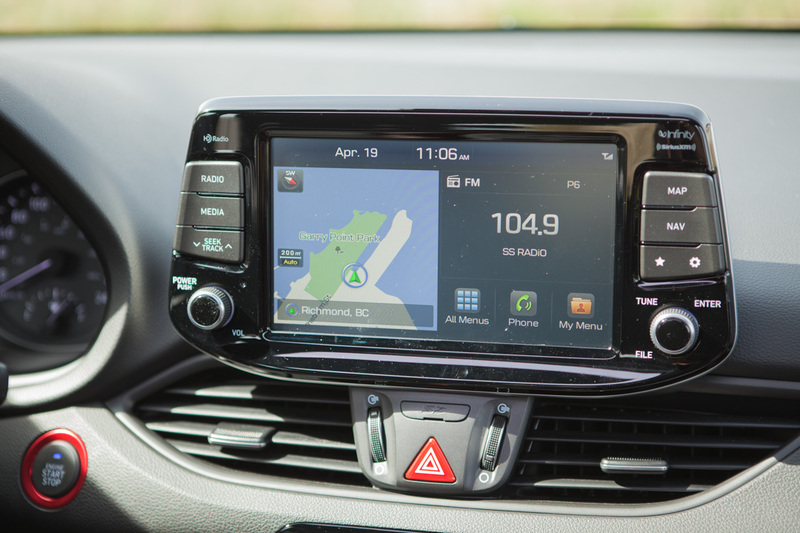 The infotainment software itself is almost identical to the Sonata that we have reviewed earlier, and it is just as responsive and intuitive. 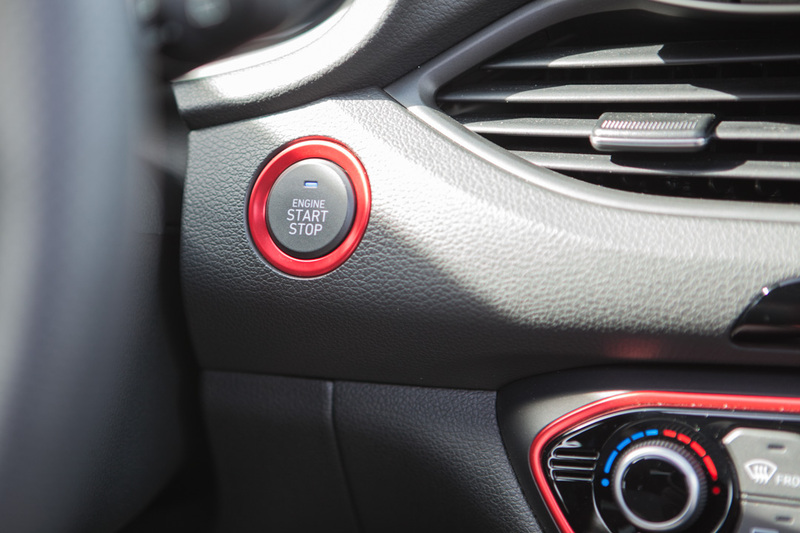 Bluetooth, Android Auto and Apple Carplay are all standard. Our tester is equipped with a 7-speakers infinity audio system which provides a great sounding experience. The helper LCD screen located in between the speed dial and tachometer provide instant information about the car. 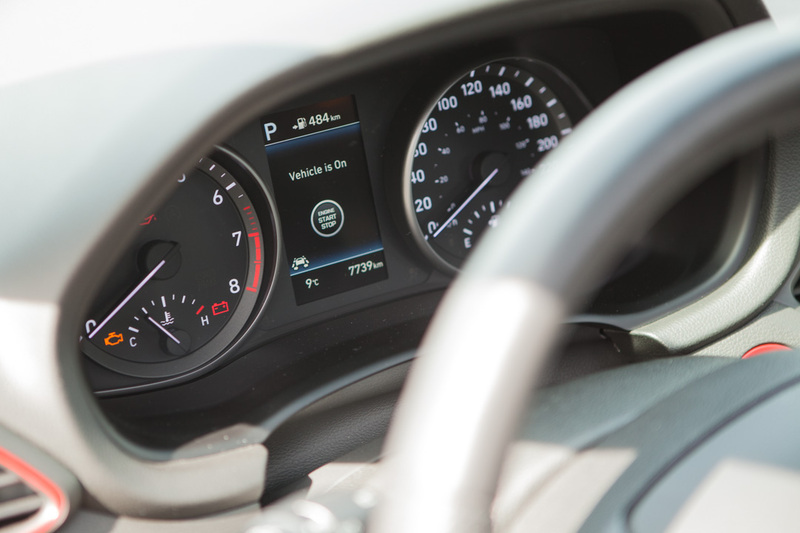 The content of the LCD screen can be configured easily through the buttons on the steering wheel. 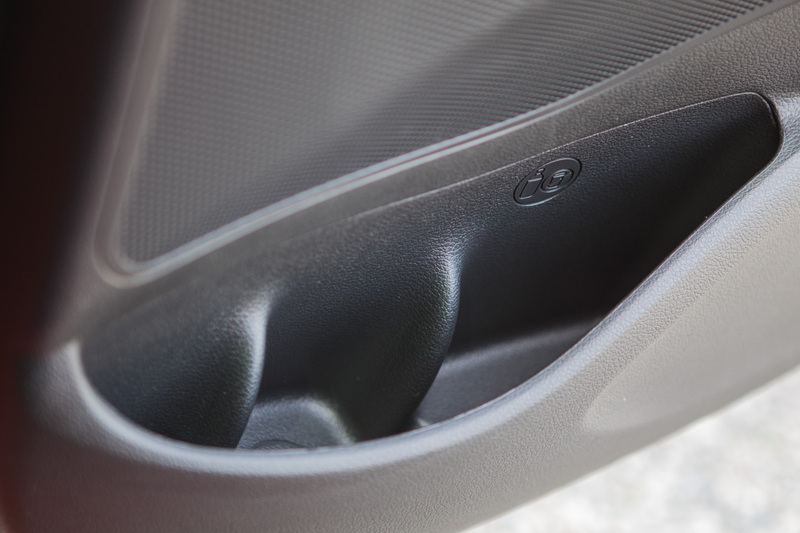 It earns 4 star safety rating from NHTSA and Top Safety Pick from IIHS. The sport version of the 2018 Elantra GT is equipped with a turbocharged 1.6 Liter 4-cylinder engine that produces 201 hp of power at 6000 rpm and 195 lb-ft of torque at 1500 rpm. You can really feel the pull of the engine especially at low rev. There is a very slight turbo lag but it is noticeable. 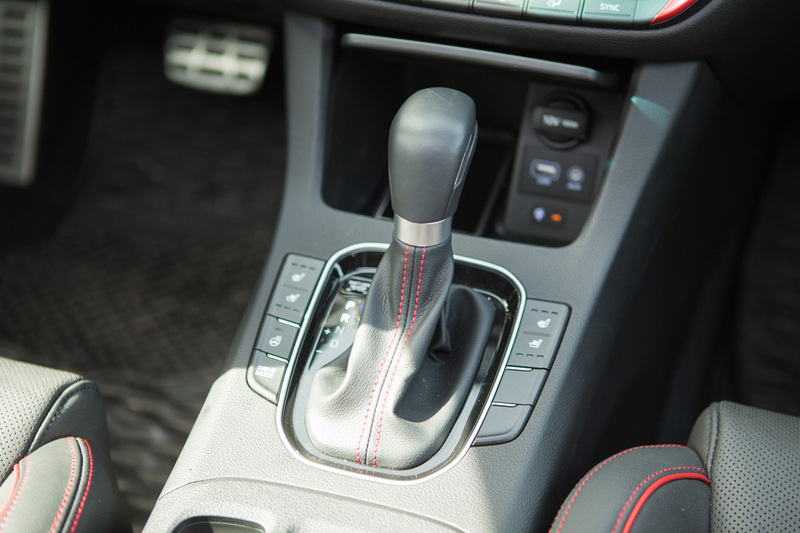 The 7-speed dual clutch automatic transmission is sophisticated but not as refined as some of the other DCTs I have experienced in higher end cars. The drive train combination is able to hall the GT from 0-100km/s in a respectable 7.2 seconds. I find the engine tend to stay on the lower end of the rpm in normal mode, possibly to improve fuel efficiency. Switching to the sports mode solves this problem but it tends to hold gear for too long. The steering is firm and has good feedback. Hyundai has upgraded the rear suspensions from the torsion beam design to the multi linked design for the 2018 Elantra GT. It proves to handle the corners well with minimal body roll. However, the lack of a limited-slip differential means that corner accelerations can produce single wheel spins. With the 7-speed dual clutch automatic transmission, the GT Sport has a rated combined fuel economy of 8.3L/100km. It is consistent with our test drive. Overall, it is a fun car to drive, but can use a little more refinement and horse power. In comparison, the Golf GTI, which has been the gold standard of hot hatches in the past 40 years, is faster, smoother, more fuel efficient, handles better, and provides a more comfortable ride. By that standard, the Elantra GT Sport falls short of being a proper hot hatch. However, the Golf GTI is a tall order to beat and the Elantra GT Sport come close at a much lower cost. While not a hot hatch, it is a damn fine car on its own that is both practical and fun to drive. There is plenty of storage options in the cabin of the Elantra GT. 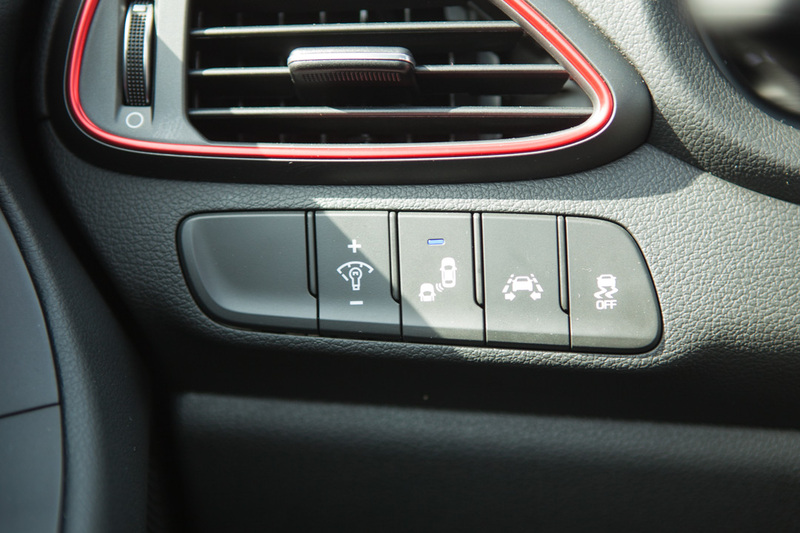 Hyundai's attention to details shown in this aspect as well. 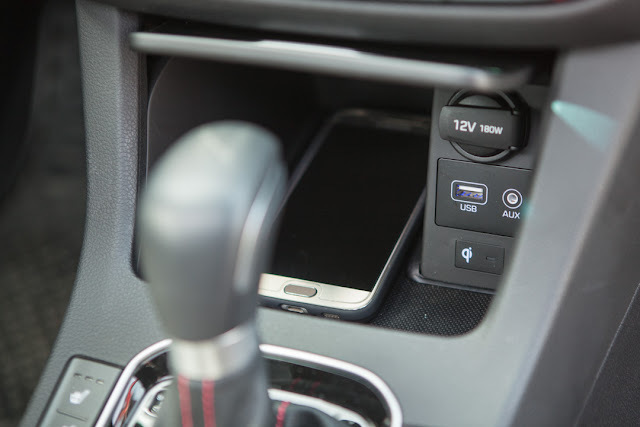 The front console pocket with a wireless charging pad, a USB charger, an auxiliary input, and a power socket has a lid that can keep things inside away from the prying eyes. Same is true for the center cup holders. 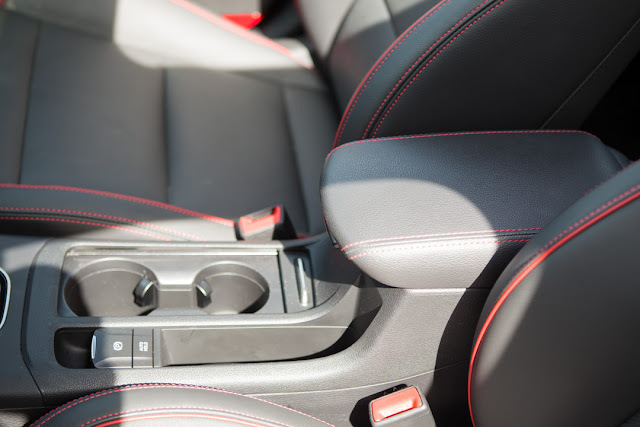 The side pockets are deep and organized, and there is a deep storage under the armrest. 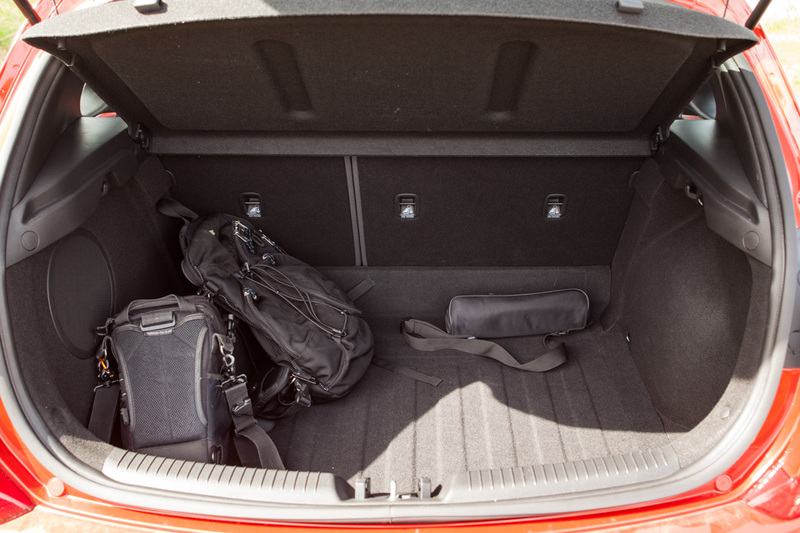 The trunk cargo space is plentiful with 25 cu.ft. of storage which increases to 55 cu.ft. with the rear seats folded down. 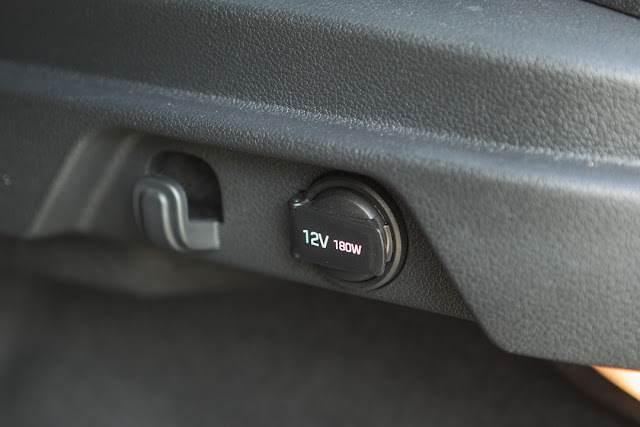 The floor of the cargo is deep and there is a power socket inside that is rare to see in a compact hatchback. 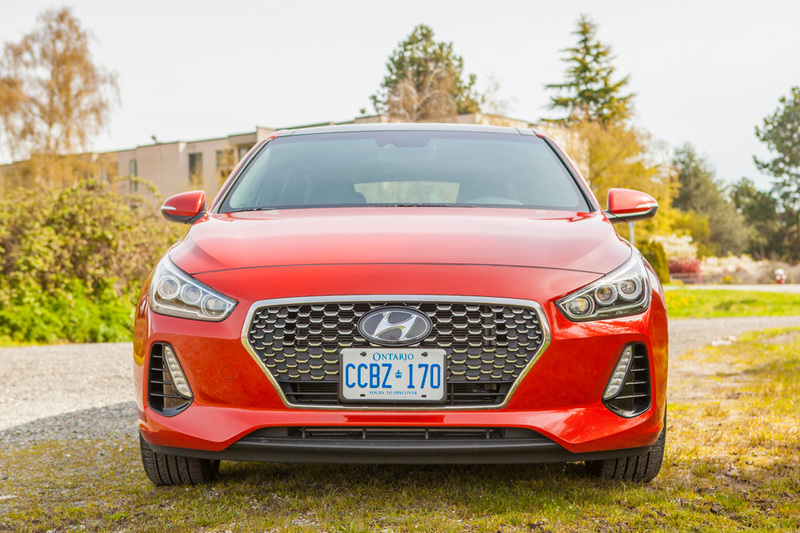 All in all, I am impressed with the 2018 Hyundai Elantra GT Sport. 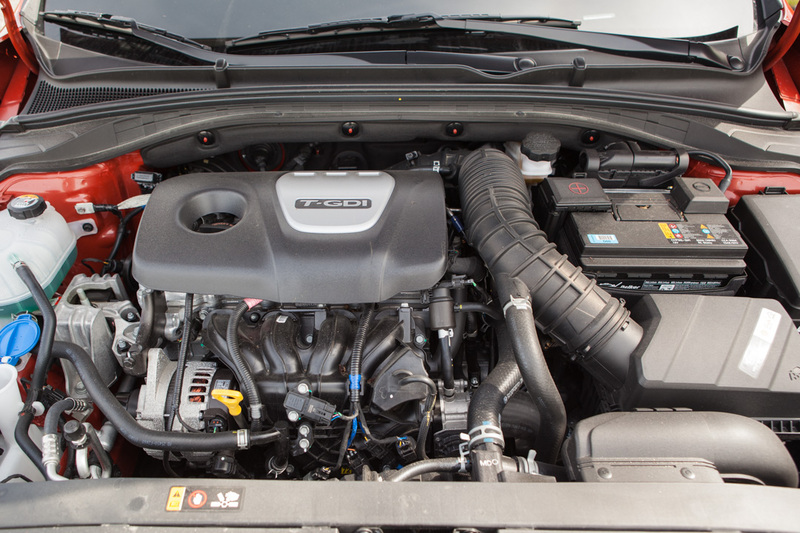 Although it can use some refinement under the hood, it is a good looking car that is both fun to drive and practical to use as a daily commuter. 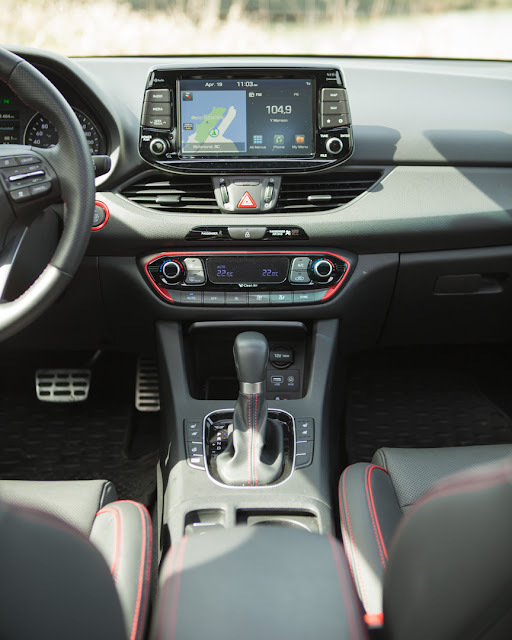 The interior of the car is excellent and provides exceptional value. Instead of comparing it to a hot hatch, think of it as a hatchback on steroid that competes with the likes of Mazda 3 and Honda Civic Si. In that regard, it is a formidable contender. On a side note, the 2019 Hyundai Veloster N is coming out soon. Maybe it will be the true Hyundai hot hatch that we have been waiting for.